Hope returned to Pendle yesterday, in the form of Rob Hope demonstrating a fine return to form at the Pendle Fell Race. Although the race is quite short at just 4.5miles and 1500ft, it often attracts some big talent. And as this year it 'doubled up' as the first round of the FRA Junior Championships and the Lancashire County Championships (so I guess you can call that 'triple-ing up' or 'buy one get two free') talent turned out, if only to sharpen its legs for the first round of the British Championships next week at Coledale. The talent in today's field included Rob Jebb, Darren Kay, Tom and Mark Addison, Andy Peace and Rob Hope. Jebb, who would go on to win, stayed in control of the race along the track and across the fields in the climb towards Pendle Hill. On hitting the fell and the long runnable climb towards the top of Pendle, Jebb pulled away showing what great climbing form he is in at the moment. Jebb appeared to keep looking behind, perhaps gauging how much damage he was inflicting on the chasing group, or maybe checking on his old rival Rob Hope's form. Hope grabbed the guantlet and led the charge after Jebb. Pendle Fell Race does not go directly to the top of the hill and back again.... No! No! No! - that would be too easy. Instead, the racers are allowed to get almost to the hill top but are then required to plunge down a rocky track to its foot again and then climb up steeply to the cairn on the top. Then with heavy legs the runners have what would normally be a easy run off at a comfortable gradient back to start in Barley village, only with heavy legs after that second climb, the legs can protest. Jebb however looked like he had given himself enough of a lead to enjoy the run back to Barley without threat, while the chasing group fought out the places between themselves, demonstrating their strengths (and weaknesses) to their competitors who they may meet again next week at Coledale. Rob Hope held on to second despite nearly going the wrong way coming off the fell, Mark Addison had a storming descent to overtake Peace and nearly catch Hope (which we know sounds more like something from a Greek myth than a fell race). Here is a link to the results which unfortunately do not include the under 18s, some of whom finished in the top 20. Katie Walshaw had some pretty big names to beat in the ladies race too. But she seemed to make light work of it, mixing it with some of the better men of the field, to put herself over a minute ahead of second lady Vic Wilkinson. 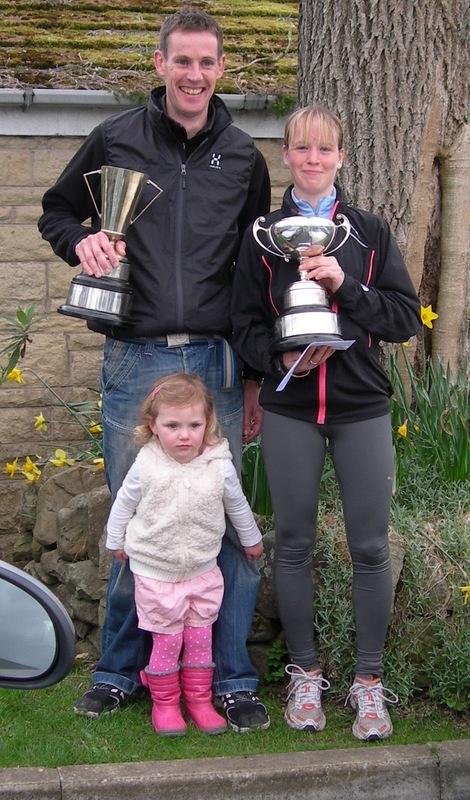 Despite the strong performances at the sharp end by Bingley in both the men's and the ladies races, the team prizes went to Wharfedale for the men and Bowland for the ladies. Anyway enough of this talk - why not watch the race yourself in Bethanie Murray's video linked here.